This page requires a newer Adobe Flash Player version. Which resource do you trust most in researching vacation accomodations? We excel in custom international consumer and B2B research. The executive team boasts decades of experience in business intelligence, marketing, and strategic planning. We meet client needs across a diverse range of retail, product and service segments, including consumer foodservice, education, food and beverage, home care, luxury goods, personal care, retailing and travel and tourism. Global coverage has included 50+ markets since 2010. Our research team brings a breadth of experience in both the qualitative and quantitative realms. We tailor the research approach to best suit the scale and scope of each client's objectives. Our network is your network: We excel at bringing together customized teams of experts and specialists to meet your specific project needs. What really matters to families when choosing a vacation destination? Whether you're a parent planning a trip or a business trying to get a piece of the action, customized planning tools have become invaluable. One of our early blog entries highlighted how initiatives like Kids Love Greece aim to inject the kid - and not just the parent - perspective. Several years later, family travel blogs have forever changed not only how travelers plan, but also how hotels, cruise lines, airlines, car rental companies promote to them, and to one another. 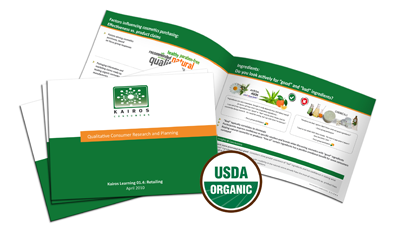 Over the past eight years, Kairos Consumers has made available a diverse range of downoadable case studies. These include Retailing in The U.S., The Natural and Organic Market in the U.S. and U.S. Consumer Attitudes Toward Greek Food and Drink Products. Please click below to download.